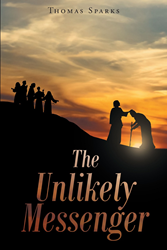 “The Unlikely Messenger” from Christian Faith Publishing author Thomas Sparks shares a fictional account of the leper healed by Jesus Christ. Through the leper’s encounters with other little-known Biblical figures, Thomas Sparks offers an intriguing look into the violent and politically divided time that Jesus Christ lived in. “The Unlikely Messenger”: the untold story of the leper healed by Jesus. “The Unlikely Messenger” is the creation of published author, Thomas Sparks. Thomas lives with his beautiful wife in Texas. They are the proud grandparents of four gregarious little tikes. John Ortberg’s marvelous book, “If You Want to Walk on Water, You’ve Got to Get Out of the Boat” inspired his writing. In the Bible, there are a lot of people who are only mentioned in passing. Their circumstances and/or names are briefly referenced, yet their stories are never told. Christians only learn of their existence and their encounters with key Biblical figures. Published by Christian Faith Publishing, Thomas Sparks’ new book shares the story of the leper who was healed by Jesus. The leper is introduced solely as an example of the miracles Jesus performed. “The Unlikely Messenger” tells the story of the leper to weave together the lives of other little-known characters found within the pages of the Bible. It is a fictional account of the violent and politically divisive times Jesus lived in. View a synopsis of “The Unlikely Messenger” on YouTube. Consumers can purchase “The Unlikely Messenger” at traditional brick & mortar bookstores, or online at Amazon.com, Apple iTunes store, Kobo or Barnes and Noble. For additional information or inquiries about “The Unlikely Messenger”, contact the Christian Faith Publishing media department at 866-554-0919.